I am grateful for what I have. I resist any urge to compare myself to others or judge myself based on other’s expectations. I have a mindset of abundance versus scarcity. I find peace in just BEing who I am and honoring her throughout the day. 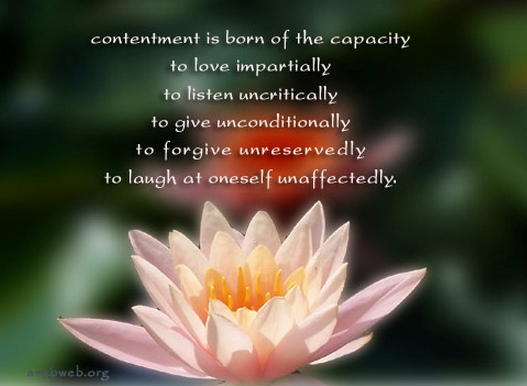 I realize contentment is accessible at any moment by moving within, breathing in deeply, and taking stock of all the blessings in my life including the people who touch my life and the opportunities I have to make a difference in the world. I attend to my breath when I need peace and contentment…I have learned so much about how to do this over the past 3 years…and still so much to learn!